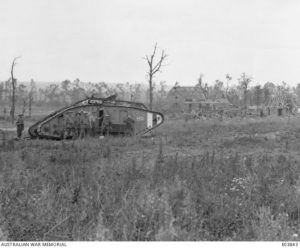 Australian soldiers and British tank crewmen stand beside H52, one of the three British Mk V tanks captured during the Battle of Hamel. Note the French flag on the roof of the house marking the capture of the position. Image courtesy Australian War Memorial. It is believed that the Influenza epidemic of 1919 caused more deaths than World War 1. Yes, that’s correct Tony. The Spanish Flu killed more than 20 million people worldwide. The total number of deaths in World War I has been estimated to be about 18 million; some 11 million military personnel and 7 million civilians. A further 23 million people were wounded. This entry was posted on July 7th, 2018.